"When I first started the program I was nervous, my bachelor's degree was in medical technology, and I really didn't know what I wanted to do. But I did okay, the classes were interesting, and I learned a lot. Having my own project, even with all the major changes that happened, was great." What are you doing after graduation? "I have joined the Air Force; I am going to be stationed here at Wright Patterson Air Force Base, working in a lab, and hopefully someday run my own laboratory." What advice would you give to incoming students? "Finish your proposal as soon as you can. If you do not know something, ask. It saves a lot of time. When choosing a lab, take into consideration three things: do they have money to fund your research, can you talk to your PI, and when you have problems, will they be there to help. Lastly, if you plan your marriage around finishing your thesis, your future wife may be disappointed." "At first when I joined the program I was very apprehensive, everything was so different from what I was used to. But I guess, whenever you are faced with challenges and you overcome them, it liberates you. Looking back I can now definitely say that this was the best thing to do!" One of our graduates of the M.S. 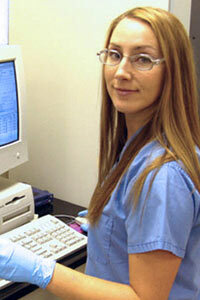 program, Stacy Casbohm, joined our program, while working at Battelle Memorial Institute. Her goals for achieving her degree included: "improving my level of scientific interaction on projects, increasing my ability to solve technical problems, and advancing not only my technical but also my scientific knowledge. What are you doing after graduation? "I continue to work at Battelle Memorial Institute." What's your advice for incoming students? "Be sure to ask specific questions during your laboratory rotations and get to know the PI as well as everyone else working in a lab. I have found through my work at Battelle that it is good to have a general idea of what you'd like to see and do, then jump at chances for particular projects when they present themselves. When picking a project, just remember that it is not set in stone. Projects and schedules may and most likely will change many times. Don't worry about it; that's what research is all about!" "I think I am one of the first international students in the program. I always had a passion for research, but did not have the tools or techniques; my previous profession was as a medical doctor in my country. The program has provided me the means to become a good scientist." First-year student Jen Plahovinsak came to the program from Battelle Memorial Institute. "As a new student in the program, I have had many challenges to overcome. I was concerned at first whether or not I would adequately adjust to the demands of returning to school after over two years off and continuing to work full time. The staff continues to go out of their way to accommodate all of my needs as a student. So far it has been a great experience." "I am enjoying the Pharm/Tox program because the staff and members have been very helpful in providing me with assistance and helping coordinate my research at Wright-Patterson Air Force Base with my classes and research at WSU. This collaborative effort has been key in my success thus far." How it has helped your career? "Although I am only in the beginning of my degree program, this opportunity will help me tremendously in my future experiences in the lab as a research scientist. A benefit of this degree is that I am gaining practical, hands-on experience that will broaden my knowledge of research techniques in the toxicology field. I know that having this degree will allow me to contribute on a more significant level to the Air Force." "The best part about the master's program is the faculty. The department is diverse, knowledgeable and willing to help students in the lab and the classroom. I am sure that is why I've learned so much in such a short time. Before I started this program, I had no idea what type of career I wanted. Through the courses and my research, I have been able to focus my interests and set a more definite course for the future." "I always had a vague plan of having a career in the life sciences, but I was never really sure what kind of career or how to go about it. My classes and research project has been a great guide in helping me refine my goals." What are you doing after graduation? "Good question. I'm open to suggestions. A vacation? I have a part-time job at the Air Force Research Laboratories at Wright Patterson Air Force Base; it may be converted to full time after I graduate." What advice would you give to incoming students? "Don't be afraid of failure. Your experiments rarely go as planned the first or second times (or third or fourth). Learn all the methods and techniques that you can, ask for help, and don't put off writing your thesis."